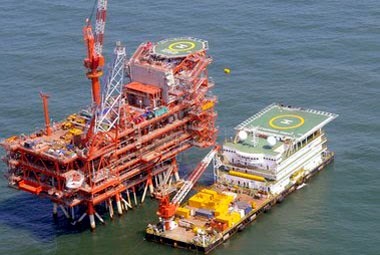 STATE-owned Oil and Natural Gas Corp (ONGC) has kick-started its USD 5.07 billion KG oil and gas project by spudding the first of the 34 wells, targeting first gas by end of 2019. Well #KDG-A on the KG-DWN-98/2 or KG-D5 block in Bay of Bengal was spud from drillship Platinum Explorer 35 km off the Andhra Pradesh coast, the Maharatna PSU said in a statement. mega project. The deepwater well has a target depth of 2,346 meters, under a water depth of 518 meters. The well is expected to produce around 5,000 barrels of oil per day (bopd) when put to production," it said. After successfully commissioning of its first deep water project S1 Vasishta in eastern offshore in March 2018 (which would be yielding about 4.3 mmscmd of gas), ONGC's flagship project from NELP block KG-DWN-98/2 in the deep water of eastern offshore is now being readied for development.